, our user-contributed "wiki-map", we've gotten a lot of great user feedback. Two of our top requested features are to more easily get data into and out of Google Map Maker. We've recently begun to address the latter with a variety of efforts ranging from making Google Map Maker tiles available in the Maps API to allowing shp and kml file download for some of the Google Map Maker data. 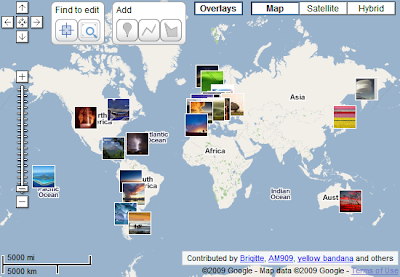 With the latest batch of new features, we now also give users a new way to bring data into Google Map Maker: Overlays. This allows users to overlay kml and image files on top of the map tiles to assist with mapping. A great file to test this feature out with is the Panoramio kml: www.panoramio.com/kml . Adding this kml will drape user-contributed photos on top of your map to give you a ground view no matter where in the world you are mapping. For a full tutorial on how to use the Overlay feature, see Overlay Tutorial. Since launching Google Map Maker, our user-contributed "wiki-map", we've gotten a lot of great user feedback. Two of our top requested features are to more easily get data into and out of Google Map Maker. We've recently begun to address the latter with a variety of efforts ranging from making Google Map Maker tiles available in the Maps API to allowing shp and kml file download for some of the Google Map Maker data.